Hex looks poised to beat Magic at it’s own game. Magic: The Gathering Online launched in June 2002, and has been absolutely terrible ever since. Despite accounting for 30-50% of Magic’s total income, the online game client has been neglected, showing its age and doing nothing to innovate on the gameplay of Magic: The Gathering. But don’t take my word for it. 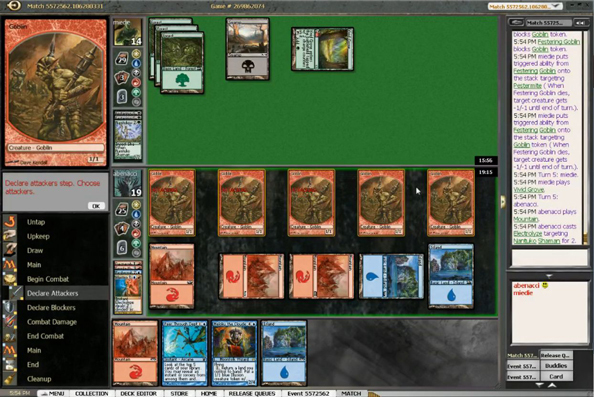 Look at this recent screenshot of Magic: The Gathering Online and let your inner geek weep for a moment. It’s like staring directly into the ‘90s. Maybe it’s excusable that Wizards of the Coast hasn’t kept their online client up to date. With no major competition in the market, there hasn’t been much incentive to invest in improvements. But Cryptozoic is about to change all that with their newly announced, soon-to-be-released, and digital-only TCGMMO, Hex. First of all, what the heck is a TCGMMO and is it an unholy union of genres that’s bound to doom us all to eternal hellfire? Yes, it is. No, just kidding–the MMOTCG tag simply means that this card game offers a lot more variety in activities than your standard Magic get-together. Things like raids, which are giant monsters with powerful decks that require three players working together to take it down. 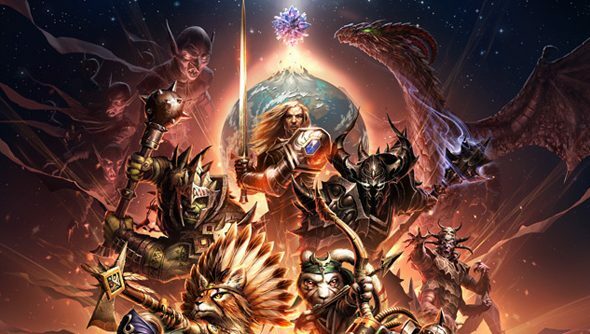 If that sounds familiar, you’ve probably played the World of Warcraft TCG, which was the brain-child of Cory Jones—Cryptozoic’s founder and CEO— while he worked at Upper Deck Entertainment. Jones eventually left Upper Deck and founded Cryptozoic, where he’s continued development of the WoW TCG, alongside tons of other branded card and board games. The reason why he wasn’t playing Magic should be obvious from the screenshot above, but he said it anyways, “Because the product that is out there now…[laughs] I don’t enjoy.” Many games spokespeople try to pretend they’re a gamer building something they want to play, but I absolutely believe it with Cory. Jones’ enthusiasm and passion for card games is evident as he bounces and waves his arms around, telling me about all the cool features Hex will have. And, man, there are a lot of them. The first key to building an MMO is social structure, and Hex is using the standard concept of guilds. But guilds are more than just a chat channel in Hex–they’re more like a club. Guildmates can practice with and against each other’s decks, leaving notes on how they think the owner can improve it. Guild teams can compete for rankings by playing against each other internally and against outside teams from other guilds. Winning in tournaments will level up your guild and increase its rankings in the global system. And of course all the tools–guild banks, deck builders, auction houses, etc.–will be there to let players min-max to their hearts’ content. Those features sound great, but I was still a bit skeptical of the “MMO” label. What about dungeons? What about a huge world? What about quest and factions to earn reputation with? What about rage-inducing lawless PvP where anything goes? Hex has all of that too. Jones pulled a massive 3D-rendered globe that rotated on the screen–the world of Hex. Then he pointed to one small section of one peninsula of one continent on the whole thing and told me that the entire first block would be taking place in this area. The world may not be huge at launch, but it will be over time. Jones said they already have 7 years’ worth of story content mapped out that will take players all over the globe. You can’t run around the world like you’d expect to in a third-person RPG like World of Warcraft, but the world is beautiful nonetheless. Clicking on a region of the globe, brings up a region area–which isn’t in-game yet–and within each region are cities, which deposit you into a 3D parallaxed panorama view (pictured below), built of traditional art with moving parts like waterfalls and birds to make it feel alive. The art is gorgeous, and Jones is very proud of how well it looks, boasting that they’ve spent more than $1 million on art for Hex over its two years of development. I wasn’t able to see any of the promised story-driven content, designed for solo and co-op play. Jones told me, “Dungeons are more like board games, almost. They’re lit up, but they’re paintings still. So you’re exploring them and unlocking pieces and there are all these little glowing symbols.” He also promised that there will be “actual narrative”–not just some throwaway dialogue in between card matches, like some other card games have produced. And while I may still need convincing on some of the MMO elements of Hex, I walked away from my demo absolutely convinced that Hex will be an incredible card game. Each card has sockets that can hold any of the 20 gems in-game at launch. 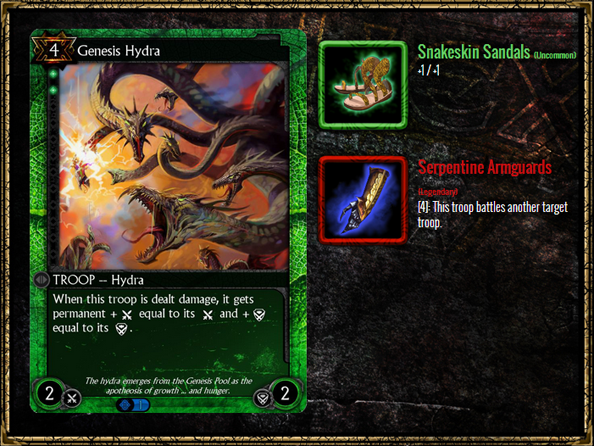 Each of the gems will change the card in a different way, adding effects or swelling its existing power. 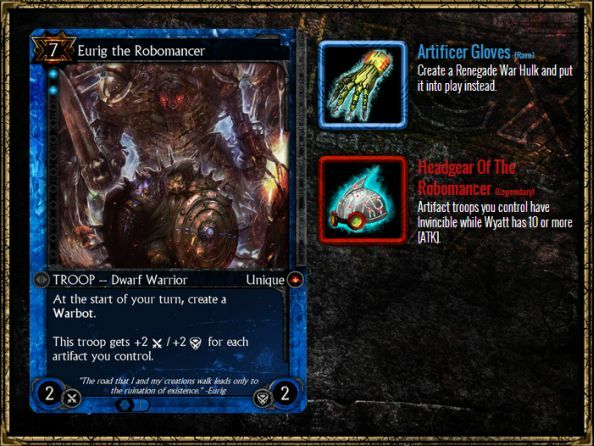 Each creature card has two equipment slots that can be used to toss armor and weapons onto them, which customize them further. Your keep (aka home base) will house Champions, which you can choose to lead your army into battle each time you play, granting special perks and hero powers to your deck for that match. Those champions can level up and specialize through RPG-style talent trees, and the samples already shown range from silly to grisly to high fantasy. Below, we have two exclusive reveals of Troop (creature) cards decked in full gear to highlight some of the changes the customization can make. Traditionalists are probably having a heart attack right now. It sounds like it would be impossible to find a balanced PvP game with all of these upgrades and customizations. And it would be, which is why all that customization restricted to PvE content. In PvP modes, players will choose from a standardized list of Champions and play with standardized versions of all the cards. That is, unless you opt to play in the PvEvP mode Jones describes as “the Wild West”, where anything goes and all card upgrades are legal. But that’ll always be a choice you can make–you’ll never be forced into it. That seems to strike a good balance, giving plenty of things to hunt, collect and upgrade on the PvE side of things, while preserving the integrity of the PvP game. Jones stressed the importance of PvP balance to me, telling me that the team spent over six months balancing Hex’s first set just for draft mode. At this point I was already sold on Hex, but then Jones dropped another awesome idea that hadn’t even crossed my mind: trophy cases. Every card in Hex is completely unique in the database, meaning they can do cool things like add a trophy case to the back of each card that keeps track of when you used that card to win the finals in a tournament or other big achievements. Because cards can be sold to other players, Jones expects things like the exact removal spell that wins the 2014 pro player match to sell for decent money to collectors and eSports fans in-game. Even if you’re not interested in collecting pro player cards, it’ll be neat to be reminded of big draft tournament wins when playing with those same cards later. The completionist inside of me squeeled with glee and committed suicide simultaneously when Jones explained to me that every single card in the game will have three achievements on it, for using it different ways or accomplishing particularly cool feats with it. Unlock all three achievements, and the card borders retract, revealing an extended version of the art that will often add new elements that change what’s happening in the scene. It reminds me of the stretching paintings in Disneyland’s Haunted Mansion ride, and gets me more giddy than I care to admit. Hex has a lot going for it at this point. The concept is brilliant—and much-craved by gamers if the Kickstarter is any indication—and Cryptozoic seem like an ideal company to tackle the rigors of making a brand new, balanced TCG. The biggest question for me is how well Cryptozoic can migrate into the video game space and tackle the myriad of technical hurdles a massive online game can throw at you. Jones said that they brought on experience MMO devs to help with that, and the pre-Alpha version of the game I saw in action looks promising. Everything I’ve seen so far has me convinced that Hex has a very, very good chance of becoming the next big card game–digital or not. I can’t wait to play it.